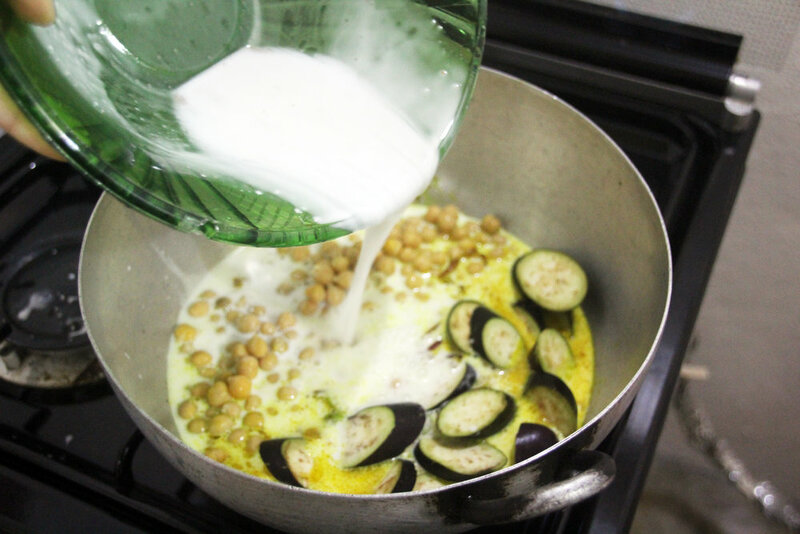 Fresh coconut milk is featured on most of our recipes, but this is a luxury we are afforded living in Batan, among an abundance of healthy and thriving coconut trees. 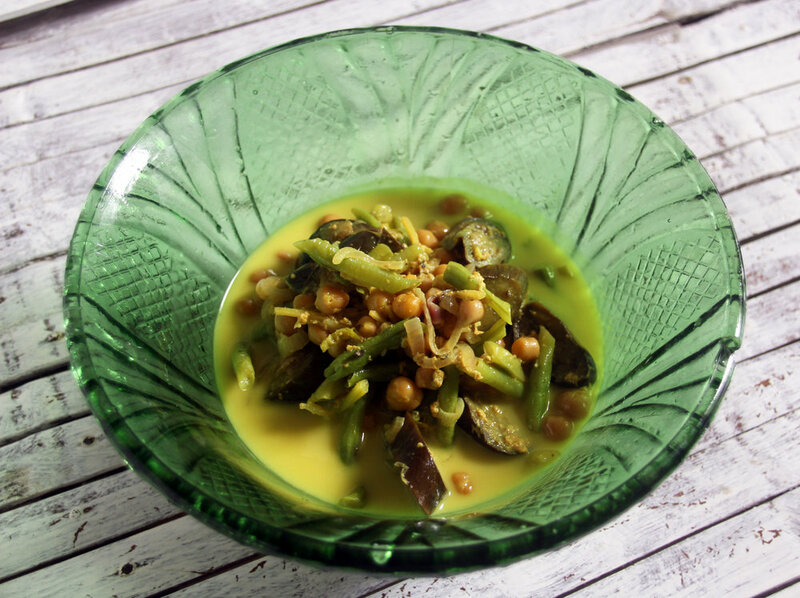 The flavour of freshly squeezed coconut milk cannot be canned and makes the difference in all the dishes we make. 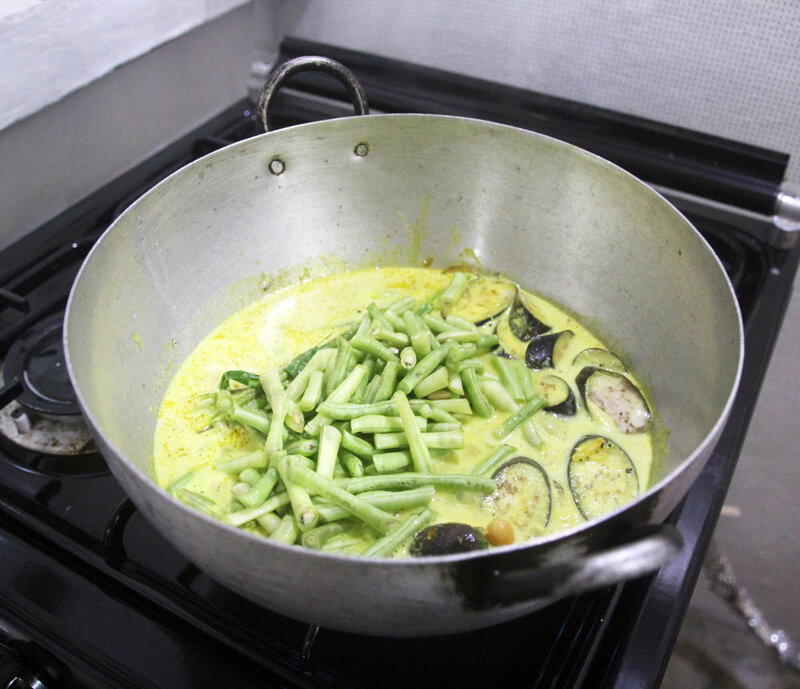 For Larissa's recipe, the coconut milk is once again the star, complimented by fresh lemongrass harvested from Elmo's House's rooftop garden. The depth of flavour is unbelievable given such a short list of ingredients. First thing to do is extract the coconut from the husk. Here, we are using the 'bolo'. You don't need great strength to open a coconut, although skill in using the bolo is a must. Let the weight of the bolo work for you. Make sure you have full control of the bolo and the coconut. 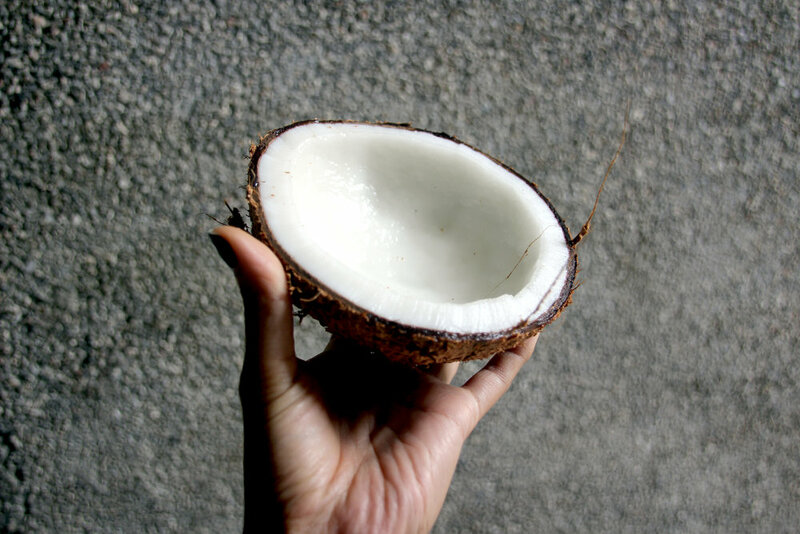 After the coconut has been halved, grate the meat into a large bowl. We use a specialized serated blade. Pour a half cup of water in the grated coconut. 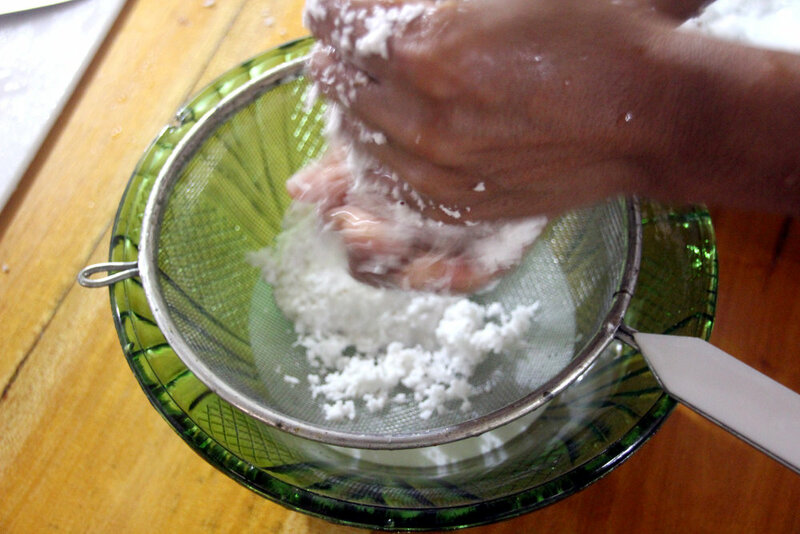 With clean hands, wring a handful of coconut and water mixture through a sieve and bowl. This will produce the coconut milk needed for the recipe. 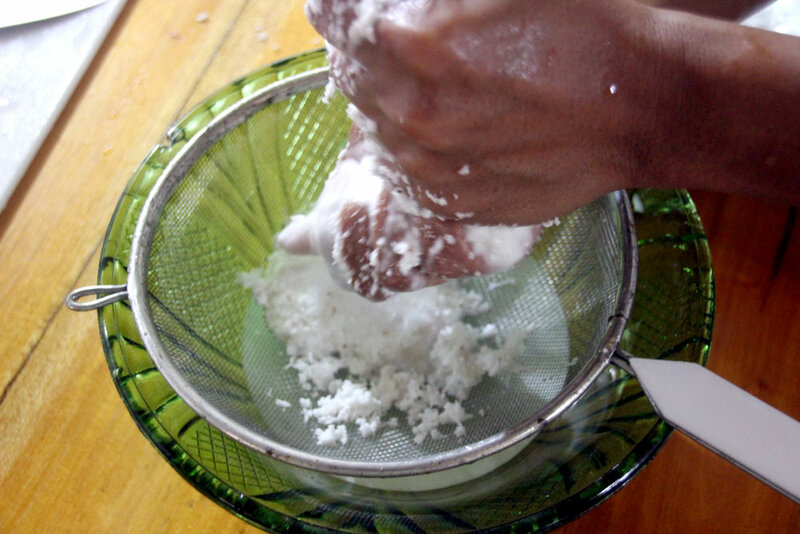 You can repeat this process twice, adding another half cup of water to the grated coconut. This will produce a good amount of milk for the curry. 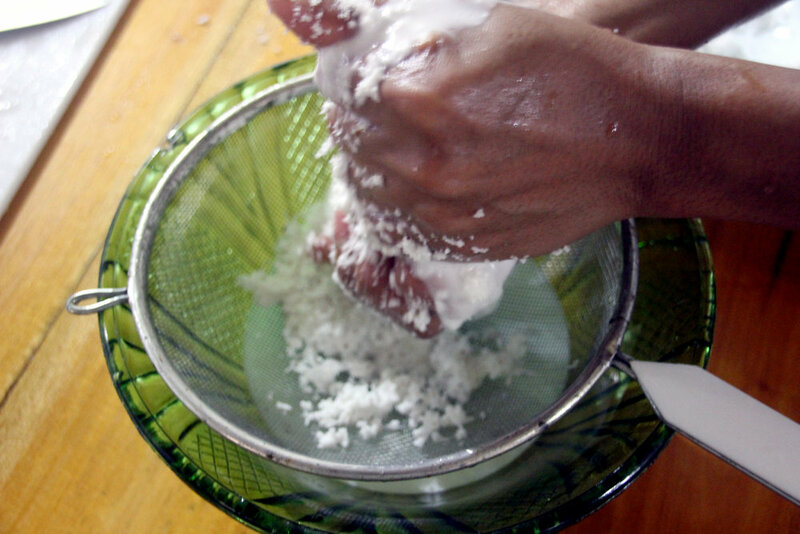 After the milk has been extracted, the grated coconut can be tossed in the garden. The nutrients in the coconut can help plants grow. 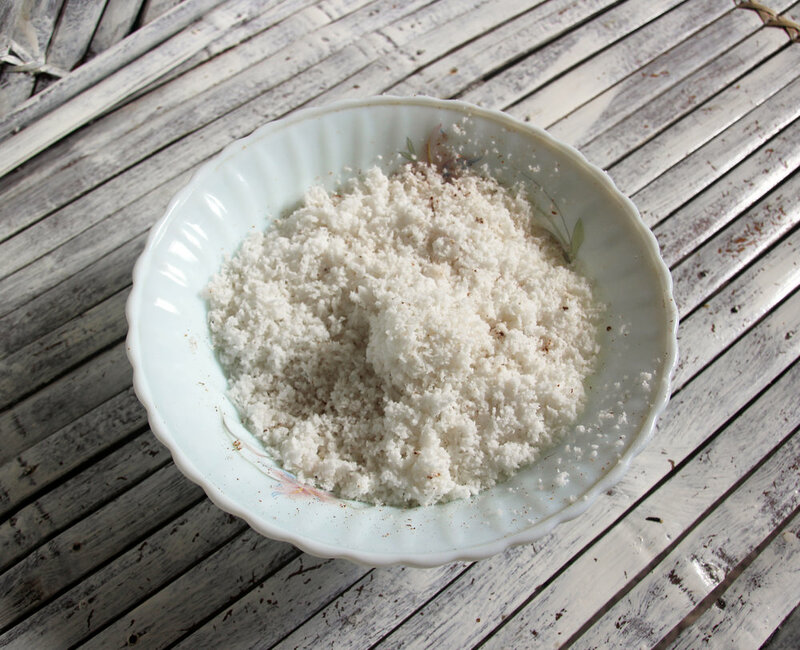 Alternatively, the grated coconut can be toasted in the oven and used as toppings for a variety of desserts, cereals, oatmeal, etc. 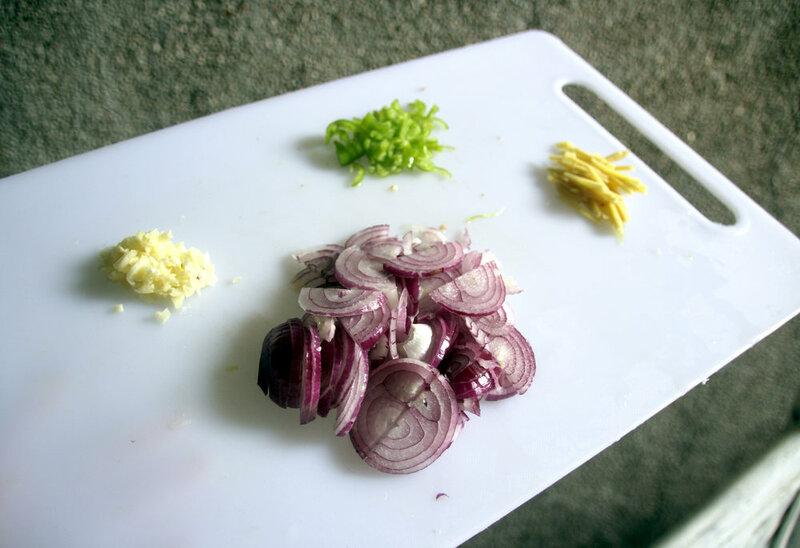 Prepare all the ingredients; cut the vegetables and measure out the seasonings. Once you have everything prepared, heat 2 tbsp. of oil in a deep heavy bottom pot. 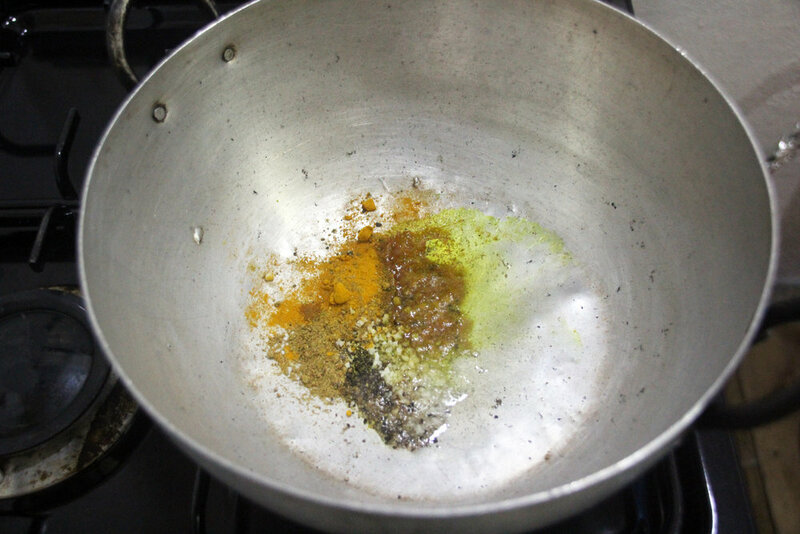 Fry and wake your spices - turmeric, cumin, curry powder, salt and pepper. After 2 minutes, add the onion, pepper, garlic and ginger. Stir occassionally. 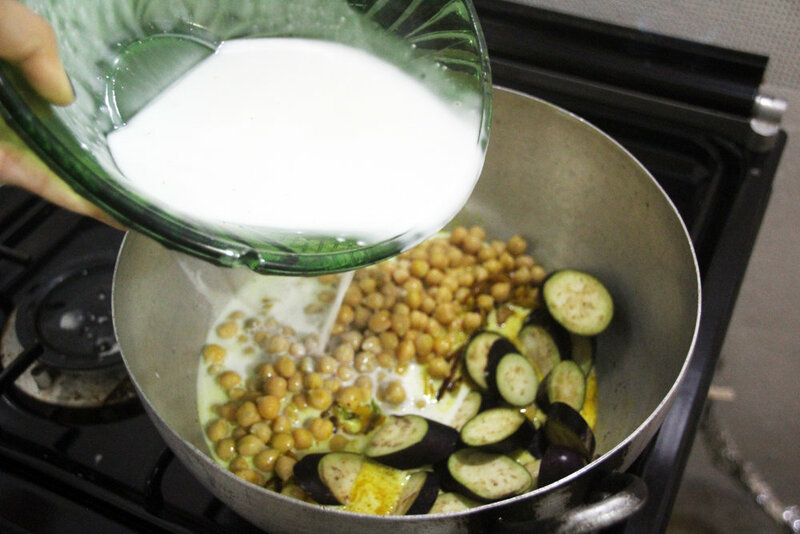 After 2-5 minutes, add chickpeas and coconut milk. 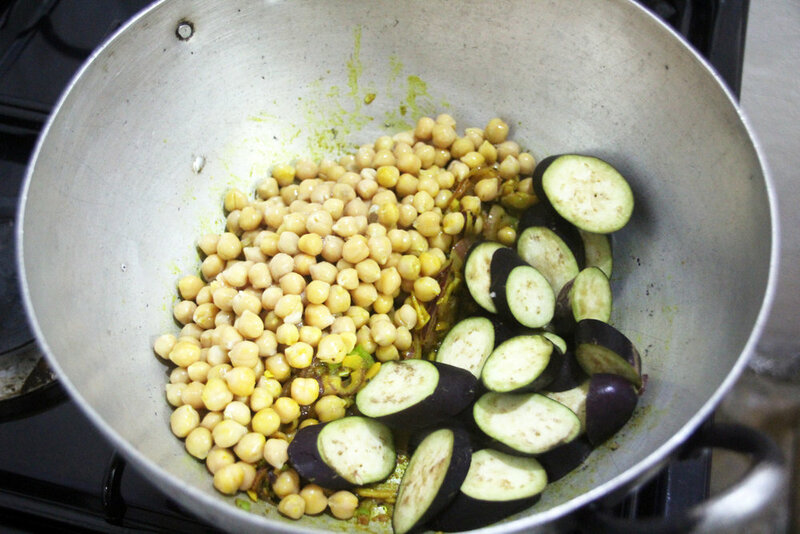 Simmer for 5 minutes, then add the eggplant. Cook for another 5 minutes. 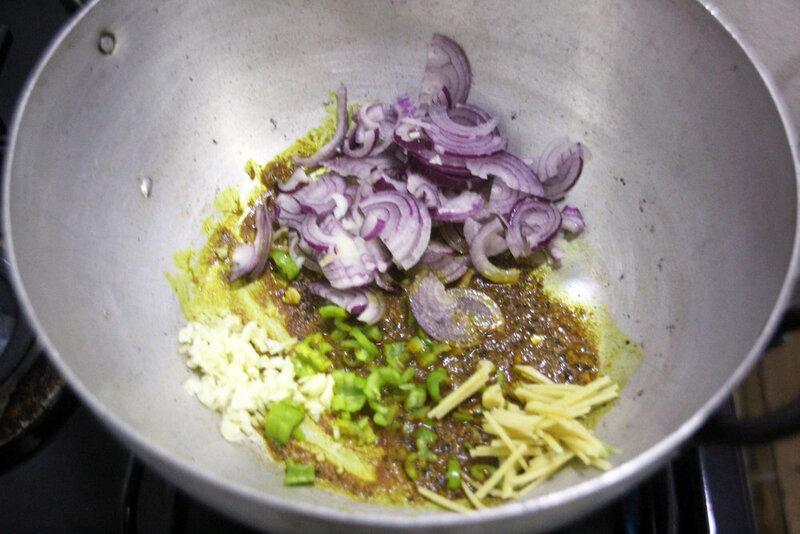 At this time, we modified the recipe a little, by adding lemongrass. 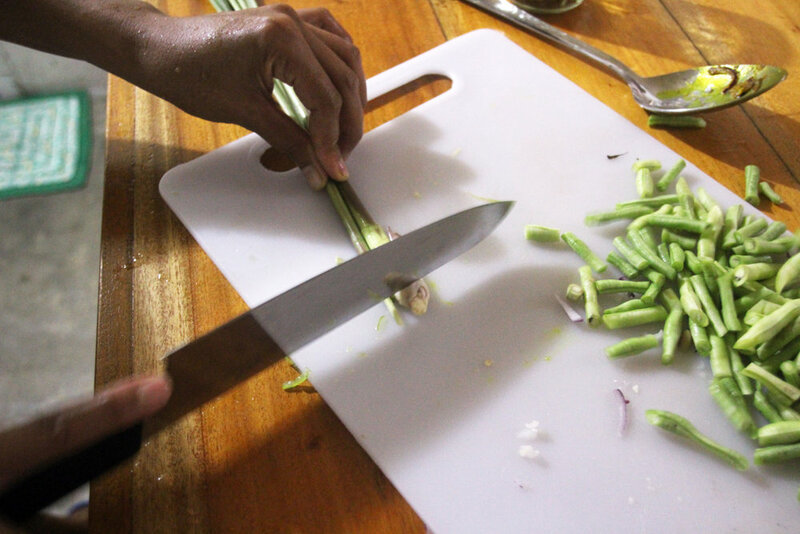 We pounded the bulb with the dull side of the knife to release the aroma and flavour, before cutting much of the leaves off. (Save the leaves to put in with the rice while cooking.) 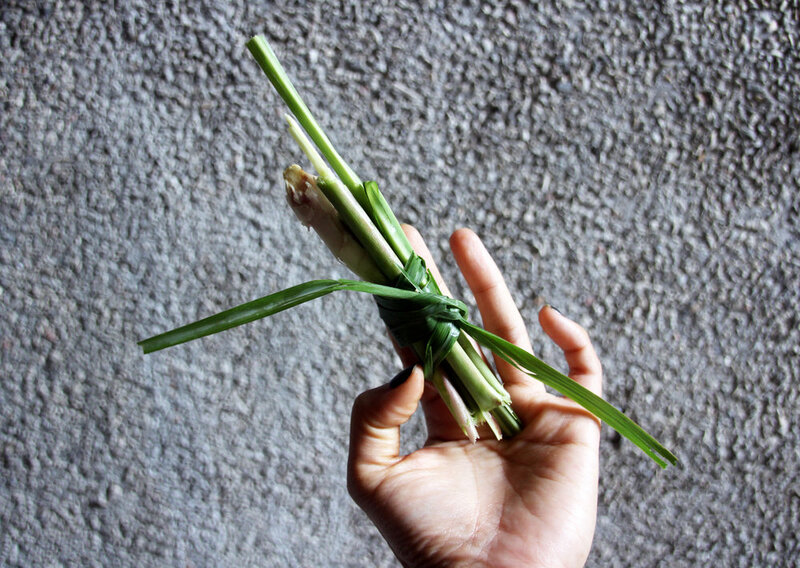 We folded the lemongrass in a tight package and dropped it in the pot. 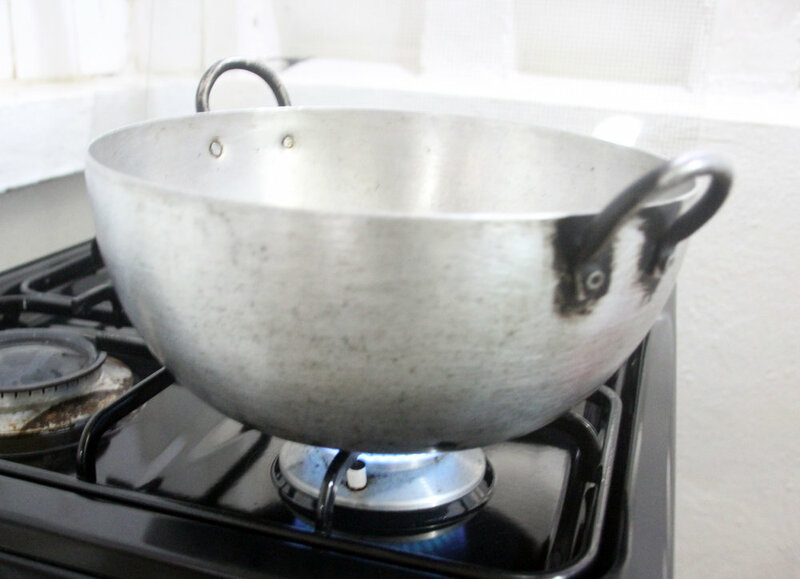 Simmer for another 5-10 minutes. Taste and season if needed. Green onions make a great garnish. 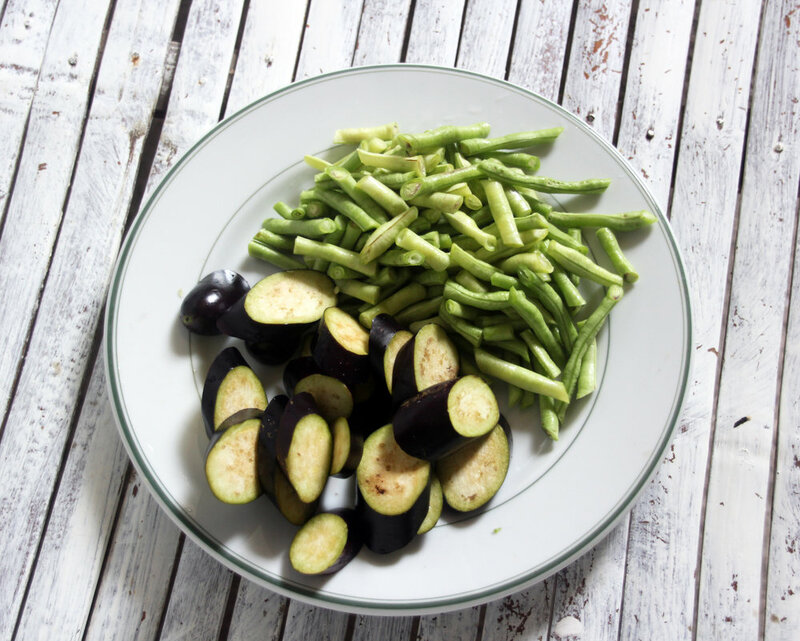 This is a very permissive recipe, substitute any vegetables or add more. 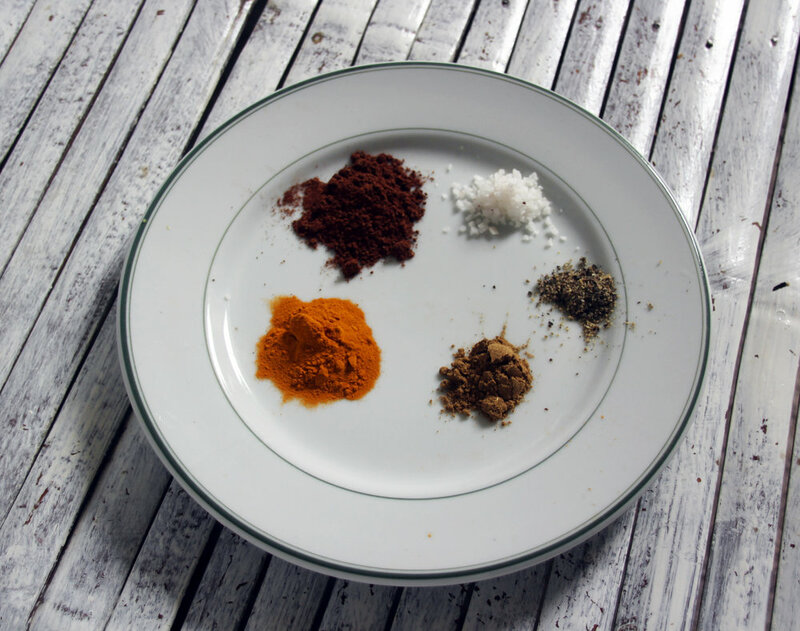 Spice to your taste! 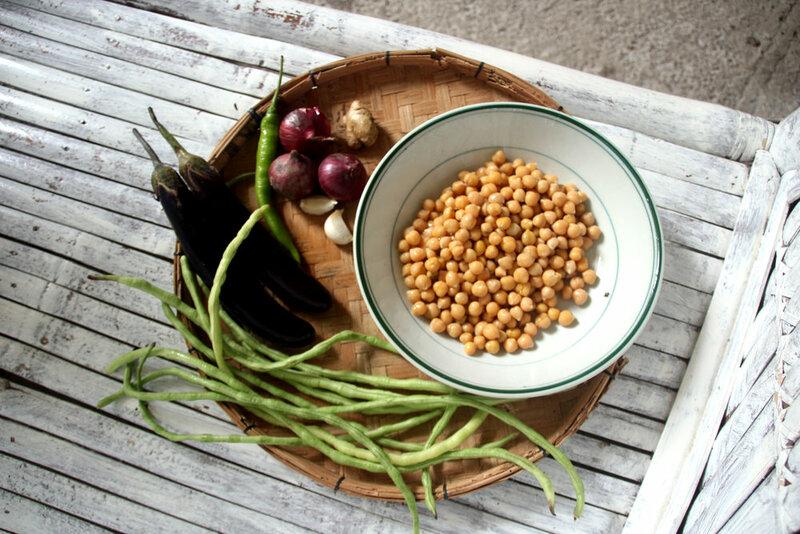 This dish is great served over lemongrass rice or even by itself. Delicous!